Are you using Pinterest to promote your business? If not – it’s time to start pinning! Unlike the mainstream social channels Facebook, Twitter and Instagram, Pinterest acts more as a discovery and inspiration tool rather than a social interaction network. But that doesn’t mean this social media channel is less important for businesses. As social media experts, CuCo know that Pinterest can be a powerful marketing tool: According to sproutsocial, over 90% of Pinterest users said they use the platform to plan for purchases – and with over 200 million users per month, that’s a lot of potential sales for your business! In order to differentiate itself from its competitors, spray paint company Krylon came up with a great idea: to show people how their old items they already owned could be worth more – with a simple coat of paint. The brand drove a van to various yard sales in six american states and bought and transformed different items with Krylon Spray paint and then sold them on Pinterest in real-time, using Pinterest’s buyable pin functionality. To spread the word, the brand updated its audience about their road trip on Twitter and posted how-to’s, animated GIFs and videos to give people ideas of how they can transform their own belongings into something new! The campaign was a great success: with a 200k investment, the brand gained 2.4m dollars worth of paid media and increased their daily Pinterest visitors by 400%. In 2012, Airline bmi launched the ‘Pinterest Lottery’. The UK-based airline created 5 Pinterest board featuring images form some of its destinations. Each board contained 9 images – each one with a number associated with it. Users were encouraged to re-pin up to 6 images and at the end of each week, a lucky number was announced and one lucky participant won a pair of free return flight to any bmi destination. A great campaign that got the brand a lot of attention! 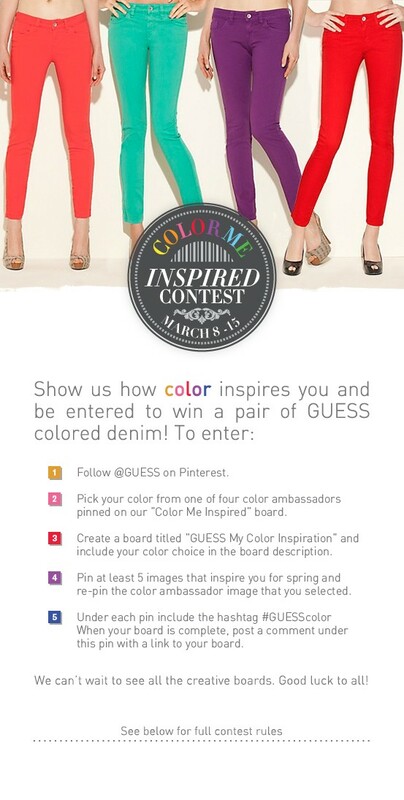 To promote their latest spring collection, Guess encouraged its fans to create inspirational boards based on four of their spring colours “Noir Teal”, “Hot House Orange”, “Red Hot Overdue” and “New Plum Light” for the chance to win a pair of GUESS colour denim. The Pinterest-exclusive contest ran over 7 days and at the end, four winners were selected. At a very low cost, this clever competition got the brand great publicity for their new collection. In an attempt to get people to take a break from social media, car manufacturer Honda approached 4 of the most active Pinterest users and offered each of them $500 to take a 24-hour pin break and actually DO the things they’ve been pinning about. The #Pintermission went viral and the brand achieved over 4.5m interactions, 1.7m followers and nearly 41 million PR impressions within just one month – all for just $2500! A great and very effective campaign! Another car brand made it into our top 5! In order to increase the number of followers on its site, Peugeot pinned various puzzles showing different cars to its site. However, the puzzles were not complete – pieces were missing! Therefore, people were encouraged to search for the pieces, pin them to their own board and then share their boards with Peugeot. The first 5 people to complete their boards won prizes. The fun puzzle helped Peugeot to grow their followers across all social media channels and the brand gained over 50,000 interactions on Pinterest within one month. If you’re in need of an exciting campaign idea to help your brand stand out, or simply need some help with your social media management, contact CuCo today on 01202 911959 or email hello@cucocreative.co.uk – we’d love to help!